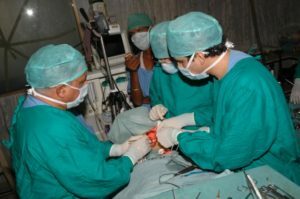 General Surgery is the art, and science of treating diseases of various body organs, injuries or deformities by manual operation. The basic knowledge of Clinical examination, diagnosis and surgical treatment planning of organ diseases is given to 3rd BDS students in the Department of General Surgery at Jabalpur Hospital & Research Center, the affiliated teaching hospital of the College. The students have to attend the theory classes, clinical demonstration of physical examination of the patients at bedside in the wards and surgical work at the operation theaters. Students are posted at Casualty Emergency Deptt. also to learn the emergency management of Trauma patients, surgical dressings, plaster of orthopedics injuries patients etc. They are also given the hands on training of intra muscular and intra venous injection procedure as well as on site training of Cardio-Pulmonary resuscitation. Department of surgery includes highly skilled experienced teachers to teach art of General Surgery.